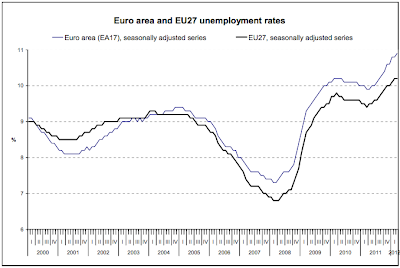 The March unemployment numbers for Europe are out - you can see in the graph above that the situation continues to worsen - particularly in the Eurozone itself. 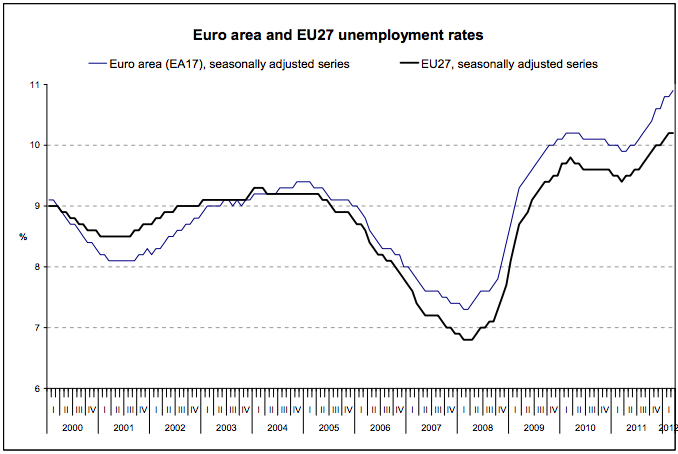 The rise in unemployment rate since late 2011 seems pretty much linear with no sign of moderation yet. The rate is now considerably above the worst point in the first dip of the great recession. That is because EU is already (oil) efficient? Or because of that plummeting (North sea) oil extraction? And what will happen when the current eu banking sector leverage to asset ratio of 26:1 will increase (Lehmans collapsed at 30:1)? I wanted to send you this link, though you may have already seen it. It kind of relates to some of the other topics you have discussed on this blog, though not specifically the eurozone or this particular entry. Sorry to send it to you this way, but I didn't see any way to email it to you. There is also a long comment by someone named "chubflounder" which is very interesting. It's not as newagey as it sounds if you actually read it.